And we know where you can score one yourself! Dear Nadine Lustre, how to be you? You showed up to your book launch in the most p-e-r-f-e-c-t denim-on-denim outfit our eyes have ever seen—mainly because of that AMAZING jacket half-falling off your shoulders. Yep, that’s her name and her signature lion artfully painted on the back! We know, we know—you want one of your own now. 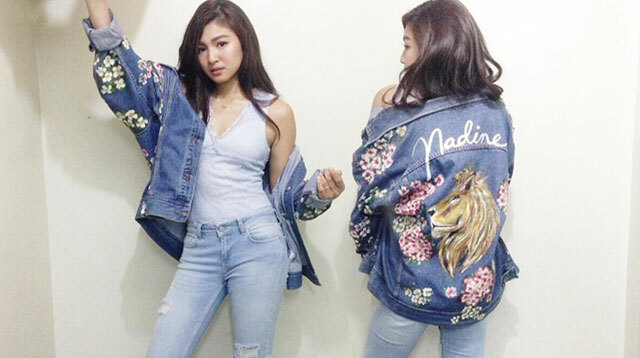 Luckily for you (and us), Nadine’s stylist, Joanna Garcia, generously provided OOTD details—jacket included. As it turns out, this was custom-made by young designers Dani and Joel Andrade for LULA. According to LULA’s Instagram page, this creation is the first ever for the brand and features the actress’ name embellished in sequins. Not too shaby for a debut, right? !